Preschool series about emotions. Ben is feeling disappointed because his friend can't come to tea and he had made lots of plans for a fun afternoon. Browse content similar to Feeling Disappointed. Check below for episodes and series from the same categories and more! # What's that feeling you are feeling? # Has it got a name? Ben was supposed to have his friend Maya come to play today. But unfortunately she isn't feeling very well. -So she can't come over after all. -We made some nice bunting for her. and when she's feeling better. What do you think, Ben? I was so looking forward to Maya coming to play. -And now she can't come, I feel all funny inside. Oh, thanks, Breagha, but I don't feel like playing right now. I made so many nice plans for what we could all do together. And now I feel... Oh, I don't know. What am I feeling? I think you're feeling disappointed. but then it doesn't happen. When your fun suddenly has to stop. Or when you didn't get the starring role. Then you might be feeling disappointed. -Does that sound like how you're feeling? those happy feelings have turned into one big disappointed feeling. I don't like it and I think I might...cry. Oh, dear. Feeling disappointed can bring up lots of other feelings too. It can make us feel like we want to cry. don't turn out how you hoped. How about you? How are you feeling today? when I didn't get chosen for the main part in the school play. -Yes, I do. You were really upset, weren't you? -Lots of different things can make us feel disappointed. Why don't we find out more about feelings from our feelings friends? Disappointed means when you want to go somewhere and your mum says no. Disappointed means when you get really kind of angry. with you and they said no, you would be really disappointed. Because they never did it with you. I feel disappointed when I don't go to the swimming pool. What makes you feel disappointed, Mia? I feel disappointed because my cat scratched me. It's always good to hear from our friends. And it's really good to talk about how we feel. and what made you feel that way? Oh, yes, go on, Ben. We might be able to help you feel better. We all made so many plans about what fun things we could do together. we were going to play. We made some cakes so we could have a special afternoon treat with her. The living room looked great. And our cakes were ready for us when we had finished all the other fun. because she had a sore tummy. And that made me feel really disappointed. Why don't we ask some of our feelings friends to join us? -They might be able to help you feel a bit better. Our feelings friends always help. -Hi, Ben and Rory, do you want to come and join us? because his friend Maya can't come to play today. But it doesn't mean we can't do all the fun things that we had planned. -Can you think of something we can do with our feelings friends? -Maybe we could play a game. We were all going to play I-spy with Maya. -So I guess we could all still play it without her. Ben, why don't you go first with I-spy? -I spy with my little eye something beginning with B.
Oh, that's a hard one! No, I can't see anything beginning with B.
Oh, oh, oh! Is it me? Oh! Well, then, if it's not me, is it Ben? And, Rory, can you think of an I-spy? I spy with my little eye something beginning with C.
Oh, I know this one. It's cake! Those are the cakes we got for Maya's visit. and she's missing out on this lovely afternoon. It's good that you thinking about how Maya is feeling. Why don't we send her one of those cakes to eat when she's better? Oh, good idea! Rory and Ben, you should have a cake, too. -You've helped me to feel so much better. -Oh, that's a great idea. There we go. -That's a pink one, and a white one. -Oh, thank you so much, Ben and Rory, for all your help today. -Enjoy eating those cakes! Bye! -I really am feeling much better now, Radha. So what have you learned today about feeling disappointed? it can make you feel disappointed. because they might be able to help you feel better. That's right. Can you remember what feeling disappointed is like? I know a lot about feeling disappointed now. How are you feeling now, Ben? I still feel a little disappointed that Maya couldn't come. But you and the feelings friends have helped me feel much better. do is to concentrate on thinking and doing other nice things, too. And let's say thank you to all our feelings friends for helping. Do you think Maya felt a bit disappointed as well today, Radha? Because she was looking forward to coming to play, too. -Do you think our cakes will make her feel better? It's great to think about how other people might be feeling. And remember to ask them how they're feeling, too. -That's what friends are for! -That's right. So how are you feeling today? # How are you feeling today? # Oh won't you tell me, won't you say? # Are you happy, are you sad? # Are you nervous or frustrated? # Jealous, kind, or confident? # Oh, won't you tell me, won't you say? # What's on your mind? # So won't you say? Ben is feeling disappointed because his friend can't come to tea and he had made lots of plans for a fun afternoon. 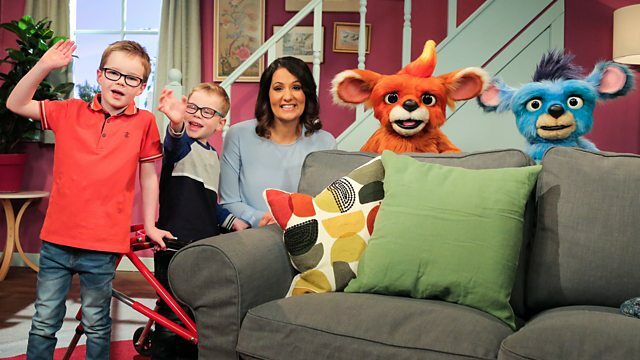 Radha and Breagha help Ben to talk about his feelings, and they are joined by their feelings friends. Together they all play one of the games Ben had planned and have a lot of fun, which helps Ben feel better.